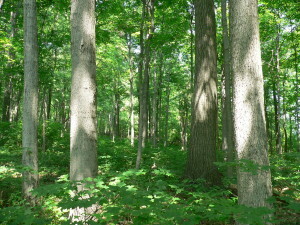 The 13-acre Wayne Woods is an impressive natural area despite its relatively small area. Located not far from Leonard Springs Nature Preserve, this preserve features a mature woods with many large trees, a spectacular display of spring wildflowers, several sinkholes. A short trail begins along Duncan Road near the northeast corner of the property, north of the neighbors’ mailboxes. Parking is limited to the shoulder of Duncan Road. The preserve was a gift of Bill and Naomi Wayne in 1996, who used to live in the neighboring house.